Mica Mountain is the left side of the huge mass to the east of Tucson. Strangely, it’s the highest mountain in the Rincon range (8,666′), higher than the range’s namesake, Rincon Peak (8,482′). Despite its closeness to Tucson there are very few ways to climb Mica Mountain. The shortest way has a daunting approach involving high clearance 4 wheel drive vehicles and unsigned forks in dirt roads. Another approach involves starting as for Rincon, then turning right instead of left at the top of Miller Creek. This is a long hike, following a ridge that I suspect is well named – Heartbreak Ridge. The third way is also a long hike but it’s very easy to get to, and this is the one I chose to do. Drive east along Speedway to the end. On the right is the Douglas Springs trailhead. Early morning there aren’t many cars, but by evening it’s often full as the initial part of this trail is very popular as a late afternoon/evening hike. It’s a long hike so plan to start early. 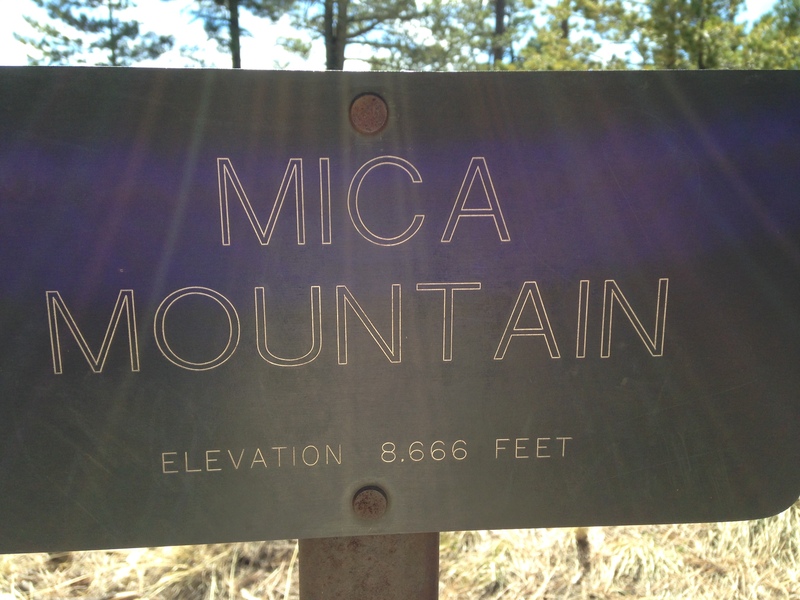 Mica Mountain is a long and somewhat tedious hike. It doesn’t have any really dramatic views, but does have some subtle beauty in places. Basically it’s a long way – 26 miles – and takes a long time to hike. It often feels that you are hiking the wrong way. There’s also a feeling of solitude as it’s a very long day hike. It appears to be popular for backpacking trips – at least that’s what I assumed from the network of trails at the top of the mountain – although I didn’t see anyone else up there. From the trailhead follow the trail for about 5.6 miles to Douglas Spring campground. Follow the trail south for 2.4 miles to Cow Head Saddle, wondering all the while why you are not heading east to the peak. At the saddle, turn left and head generally eastwards for about 4.8 miles to the summit, passing the impressive Helen’s Dome and then the smaller Spud Dome. It’s worth taking a map or a printout of a map as the top section of the mountain has a network of connected trails and you want to be sure you take the correct forks in the trail. Trails Illustrated Map 237 “Saguaro” is a good map that shows the trails on Mica Mountain and Rincon as well as the peaks in Saguaro West and Tucson Mountain Park.